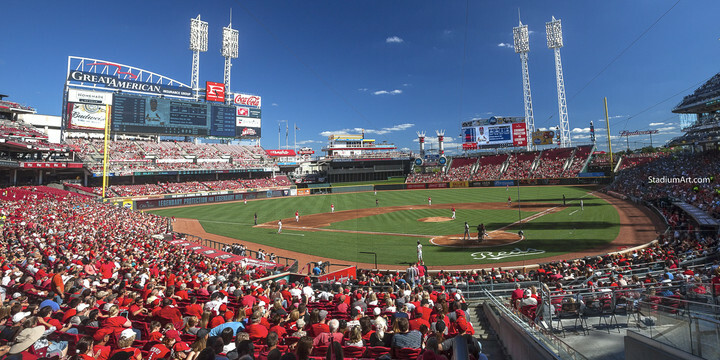 Cincinnati Reds play baseball at Great American Ball Park in Cincinnati Ohio. Previous baseball stadiums include Crosley Field and Riverfront Stadium. Legends of the Cincinnati Reds include Sparky Anderson, Johnny Bench, Dave Concepcion, Willard Hershberger, Fred Hutchinson, Ted Kluszewski, Barry Larkin, Joe Morgan, Tony Perez, Frank Robinson and Pete Rose. The fine art photos are available in various sizes including 11x14 photo, 13x19 print, 8x10 image and 40x30 canvas frame.